If you haven't heard of new artist Kasey Tyndall, start listening. She's heading big places, very quickly with the help of Tennessee East Management and with praise by artists like Keith Urban and Lucy Hale. I had the pleasure of meeting and sitting down with Kasey before her show with Easton Corbin and Kelsea Ballerini at City Limits Saloon in Raleigh, NC on January 3 as part of the WQDR "Happy Q Year" event. Love this girl. Smart, determined and guns loaded, she's ready to make her mark and put females back on the country music charts. Kasey: Hmmm ... I'm 19 years old, I'm from Greenville, NC - Go Pirates! They're actually playing in the bowl today, not sure if they're winning or not. I was born in Rocky Mount and shortly moved to Greenville after my parents divorced. I taught myself to play guitar when I was 10 and I've just been writing and playing ever since. I love to hunt, I'm very outdoorsy, I'm going to school to be a nurse. Lovin' Lyrics: Sounds like you have a little bit of everything going on. Kasey: Yes, I'm busy busy! Lovin' Lyrics: So how did you get into this, who first heard you? Who said "Hey, you know she's got that something that other people need to know about?" Kasey: You know, since I learned to play guitar, I've played festivals and anywhere that would let me play, but I think the biggest thing was when I won the WQDR contest and won a chance to sing with Keith Urban and after I sang with Keith at Walnut Creek, it all just kinda took off after that. People were calling and then I got hooked up with Tennessee East with Kevin Frazier and Dave Rose. Lovin' Lyrics: Kevin and Dave are the best two people you could have ever hooked up with. Kasey: Yes they are. I'm so excited. 2015 is gonna be crazy. Lovin' Lyrics: Tell us more about the Keith Urban thing, how did that come about? Kasey: Keith Urban reached out to all the radio stations in every city and told them he was holding a contest to give a local artist the opportunity to sing with him on the song he recorded with Miranda Lambert, "We Were Us". I called in to WQDR, I placed in the Top 5 and they sent the Top 5 off and Keith picked me. I got lucky, I tell ya, because there were a lot of good people in the contest. Kasey: Oh yeah? My heart was about to beat out of my chest. Inside I was dying! Lovin' Lyrics: You couldn't tell, it was like you'd done this forever, kind of like you were thinking "this isn't a big thing, it's just Keith Urban, we're good." Kasey: He was so nice, he even gave me a guitar afterwards. It was a great night, Honestly, I was not prepared when I walked off stage for how fast things would move. When I won, I just thought "Hey, it's a song, I'll get my name out there ... cool." Oh no, it went much further than I ever dreamed. I'm very blessed, I'm very excited. Lovin' Lyrics: Well, people are definitely picking up on you. I'm starting to see your name around. It's good! So tonight, are you going to perform any of your original music? Kasey: I am. I'm performing all 3 songs on the EP that will be coming out hopefully in February, but if you follow me on social media, we'll be setting a definite date here soon. I'll be playing the 3 songs from the EP and actually throwing in a little surprise. I co-wrote one yesterday here in Raleigh with my friend Lauren McLamb and she's gonna be here so I decided to throw that in the set list and make it special. Lovin' Lyrics: What artists have you opened for? Kasey: Jason Michael Carroll, Josh Thompson, Lucy Hale, and Phil Robertson from Duck Dynasty. Phil came and spoke in Greenville and I got to open up for him and sing before he spoke. It was different. He was so cool. He was the coolest guy. Miss Kay was there too, that was just cool. Lovin' Lyrics: That's cool that you opened for Phil. Lucy Hale was also a big one from what I hear. Kasey: Whoa, that one was great! She's the nicest artist I have ever met. As famous as she is, she just sat and talked with me for over an hour. She'll text me. If I texted her today, she'll text back. It's crazy! 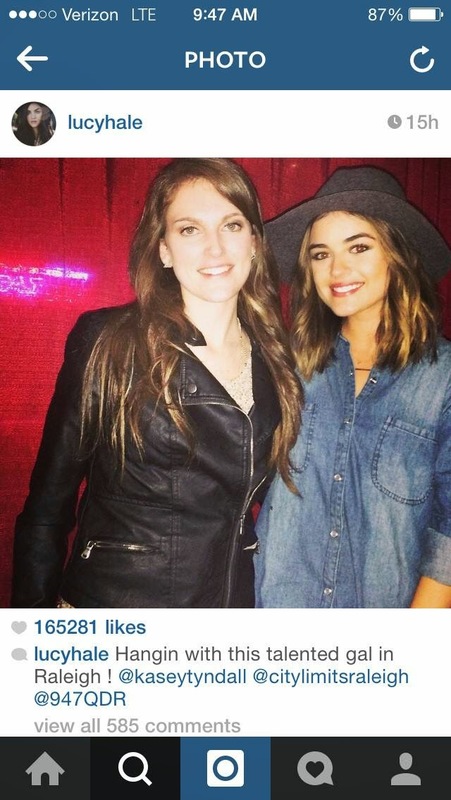 Lovin' Lyrics: She posted the picture of you both on Instagram and had over 165,000 views, right? Kasey: I think it's closer to breaking 200,000 now. Lovin' Lyrics: You've had a lot going on. 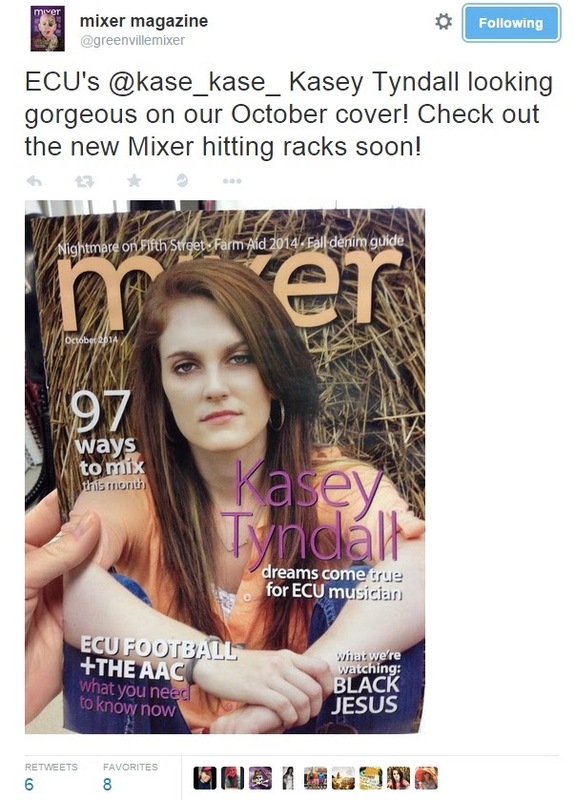 You were a cover story on Mixer Magazine? Kasey: Yes! I was really shocked. I had told my mom last year a couple of my goals for music and one of my goals was for the ECU Pirate Nation to kinda know who I was, just a little bit, you know maybe play somewhere in Greenville and the magazine asked me if I wanted to do a story. I had no idea I was going to be on the cover, at all. Somebody stopped me at a restaurant across from campus and said "Is this you?" All I could say was "Uhhhh, yes .. Oh my gosh!" Lovin' Lyrics: You've got a local event coming up on January 17, the local Band Together show? What's that all about? Kasey: The event is about making a change through music. It's going to be myself, the Johnny Orr Band and Yarn. It will be here at City Limits Saloon on January 17 and you can get your tickets through ETix, I believe. Lovin' Lyrics: Being a female in country music right now, are you finding it tougher than you thought you would as far as the environment and getting your music out and getting it heard because lately it's been a man's environment. Kasey: Actually no, because you know, I'm just being myself and I've always grown up as "one of the guys" so as long as you get up there and cover some Brantley Gilbert, the guys are just as excited and just being yourself is the best thing to do. I'm not scared to pull out the Brantley. One of my songs, "Let Me Drive" is a song about female empowerment. Guys take to it. As long as you just be yourself, I think being a female is just sticking to your guns and as long as we do that, we'll be fine. Lovin' Lyrics: If you had to market yourself to potential fans, what would you say? How would you describe your music and why should people listen to you? Kasey: Hmmm, that is a tricky question. If I was comparing my style to another artist, it would definitely lean more towards Miranda Lambert. She's country, down to earth, loves to hunt and fish and that kinda comes out in my music as well. That's definitely what I'm marketing, let's take it back to country, you know what I mean? Lovin' Lyrics: Tell us one thing about you that we probably shouldn't know but you're gonna tell us anyway. Kasey: Hmmm, that's a good one. I feel like I've already told you everything about my life already! (laughs). I mean, really, whew. Lovin' Lyrics: Ok, so we'll ask ya another one .. what was your most embarrassing moment? Kasey: Hmm, my most embarrassing moment ... Oh! Jim Shockey is another person that I've opened up for. He's a huge outdoors man, you know I love to hunt so I got hooked up with him doing some outdoors events in Greenville. All I had to do was play two songs ... TWO! That's it, two songs. Well I bombed on both of them so bad. I messed up both songs, more than two lines. It was so embarrassing, I was just like "Get me out of here." Everyone knows that song too! It was bad, but you know, you just gotta put it behind you and forget about it. Lovin' Lyrics: Good, so we're not gonna expect anything like that tonight? You're gonna pull them all off flawlessly right? That's kinda hard, especially with Easton Corbin in the room. Kasey: I know right! After hearing him sound check, I was like "I don't even wanna get up there". He is so good. Lovin' Lyrics: So how can people get in touch with you online? Kasey: My website is just www.kaseytyndall.com. If you google my name, I'm on Instagram, Twitter, Facebook and Vine. Just follow me and I'll be keeping everyone up to date on the EP and where I'll be performing. I do handle my own social media, told my managers hands off. As someone up and coming, just like Kelsea Ballerini, to me she's made it. For her to retweet my tweets really makes me feel good so I never want to pull that wall up between myself and my fan base. I don't want to have someone else handle that for me. It's special when you tweet someone back and let them know that you care. They'll take to you better. Being a songwriter, I'll get on the personal side with you, I'll tell you my whole life if you want, that's just how I am. I'm very open, I'll talk to anybody.